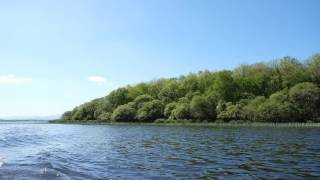 As well as being a popular holiday destination and boaters' paradise, Upper Lough Erne is a designated Special Area of Conservation (SAC) of international conservation importance. It's also an Area of Special Scientific Interest (ASSI). It is recognised for its significance as a natural eutrophic lake and for its old sessile oak wood and alluvial forests, both of which can be found in Aspen Wood. For a really useful map of the waterways in Lower Lough Erne, click here. The landscape of Fermanagh is dominated by the legacy of repeated periods of glaciation, and Upper Lough Erne is characterised by numerous small wooded islands formed of small rounded hills left behind by the glaciers, known as drumlins. The area has 13.6% woodland cover which is over double the average woodland for Northern Ireland, and most of these woods are of ancient origin and contain a rich diversity of tree species and associated flora and fauna. For example the lake is noted for its very high density of otters, and is an important wintering area for birds including Greenland white fronted geese and Whooper Swans. Aspen Wood takes its name from the graceful aspen trees which can be found close to the south west shore of Deal Island. Aspen is an uncommon tree noted for its beautiful leaves which tremble in the slightest breeze, making a distinctive rustling sound. The wood contains a variety of habitats in a relatively small area, ranging from the rushes and sedges on the southern shore, through the low lying wet woodland on the fringes of the lough where there are species such as aspen, downy birch, alder and willows, to the area above the original shoreline that was exposed when the lough levels was lowered during the 19th and 20th centuries. Here there are magnificent mature sessile oaks, tall ash trees, towering Scots pines and spreading beech trees, with flowers such as orchids, wild garlic and primroses among others. The relative isolation of the island - it is actually only 15 minutes boat ride away from Belle Isle bridge which is accessible by car - means that management has been absent for probably over 100 years and the woodland has been able to develop naturally. As a result natural woodland processes are in evidence wherever you look. The wet woodland is a good example of how newly exposed land becomes wooded in the absence of grazing animals - as it would throughout the British Isles if farming ceased. The oak dominated woodland on the drier land above the old shoreline, which is marked by a rocky "rampart" meandering around the island, contains trees at all stages of growth and decay - here you will find undisturbed rotting trees, a haven for minibeasts, which crumble at a touch, as well as recently germinated seedlings of many species, and everything in between. The presence of deer which swim from island to island, and the dense overhead canopy, has led to a relatively open woodland floor and an absence of dense undergrowth, but where gaps form when trees die or blow over there is prolific natural regeneration, largely of ash and of beech. The beech and the Scots pine were obviously planted as they would not have arrived here naturally (although Scots pine did occur in Ireland in prehistoric times), but they add interest and visual diversity, and they by no means detract from the wood's naturalness. A good size shed has been built on the level ground near the top of the drumlin which will provide the owner with a great resource for storage of supplies and perhaps tools, as well as somewhere to shelter from in the damp Fermanagh climate or even for the odd overnight stay. If you do sleep here, you will be struck by the peacefulness and sounds not usually associated with camping in woodland, such as the honking of geese, swans calling, and perhaps waves crashing. Aspen Wood can be accessed by a small boat such as those available to hire from Belle Isle Estate: with a little practice you will become adept at guiding your boat in between the small rounded rocks on the shoreline, stepping into the shallow water and tying your boat to a handy willow tree. If you wish to hire a boat it can be arranged through woodlands.co.uk. Aspen Wood is bounded by Upper Lough Erne to the south, west and north; the eastern boundary is marked by a line of round wooden posts marked with red. Aspen Wood on Deal Island lies in Upper Lough Erne which is about 7 miles south of Inniskillen and 80 miles west of Belfast. As viewing is rather involved we suggest a quick call to Andrew before visiting the woodland. 1.Click here for Bing Maps Directions enter your own postcode, (the coordinates for the slipway are already entered) . head upriver in a southerly direction passing the boatyard to your left and taking the left river fork until you reach Belle Isle Bridge, then follow the directions below. If you are hiring a boat from Belle Isle Estate, you can pick it up from Belle Isle Bridge which is about 5 miles west of Lisnaskea (BT94 5HG). 1.Click here for Bing Maps Directions enter your own postcode, (the coordinates for the bridge are already entered) . Follow the river channel south, leaving the bridge behind you. Follow the left bank as the river widens out into a broad channel with Belle Isle Castle at its head, and navigate towards Inishbeg Point, a grassy headland across the mouth of a small inlet. When you reach the point head towards the two small islands to your right - Finnis Island North and South - and pass them on the starboard bow. Aspen Wood is at the right, or western end of the island. Moor your boat near the red topped posts and make your way up the pathway between the trees.